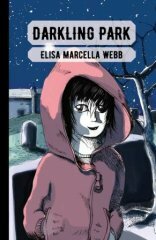 A story set in a graveyard. When Fin and her family move to Darkling Park, she worries about why their new home is called Blind Twin House. Fin makes friends with Zen and his odd stripy dog. Together they discover there’s something weird and wonderful beneath the graves, and that Ty may not be a dog at all. Elisa taught at a top London School for eight years. She then graduated with an MA in Creative Writing in 2013 and is now a part-time Ph.D. student at Kingston University. Her special interest is Southern Gothic literature. She has two daughters. Darkling Park is her first novel. What is 10 - 9 ? Fantastic. Such a great story of friendship and triumph over adversity. I really believe this is a great novel about children and adults overcoming the Big Bad. I wrote it with those great Edwardian children's adventures in mind to celebrate my community in South London working together, as we do, no matter our background. It's intriguing and charismatic but I'm a little biased I suppose.